Visit Us 308 Lake St.
Henley Honda | Community | Honda helps makes Wishes come true! Honda helps makes Wishes come true! Not only do we manufacture and sell high quality, reliable and safe cars, SUVs, vans, and trucks, Honda also makes huge contributions to the communities it services across Ontario and the rest of Canada. This was no more evident than at the recent Honda Indy Toronto. 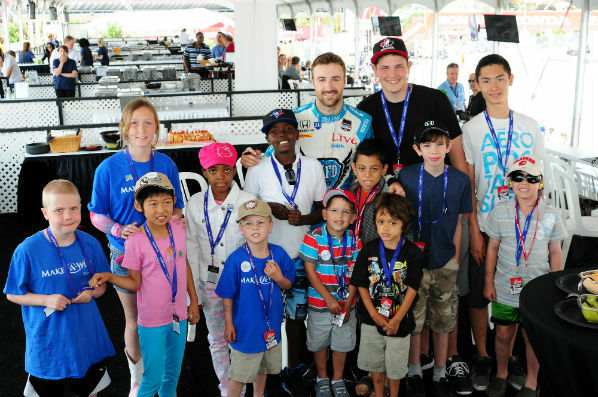 During the Honda Indy Toronto (July 18th – 20th), the Ontario Honda Dealers Association and Honda Canada Inc. partnered together with Toronto racing fans to raise money for Make-A-Wish® Canada. The generosity of all of these parties resulted in a donation of $62,000 to the organization, marking the fifth straight year of fundraising at the even for Make-A-Wish® Canada. The combined efforts over the past half-decade have resulted in more the $370,000 being donated to the charity. The Honda Dealers Association was formed in 1989 and represents 77 Honda dealers across 62 communities. Working with Honda Canada Inc. for the past five years, they’ve present Fan Friday at the Honda Indy Toronto, where attendees are encouraged to make a donation to Make-A-Wish and take advantage of everything the event has to offer on that day! Donations were accepted at all games and activities such as the Honda Pit Stop Challenge and the racing simulators. Every dollar collected for the charity was then matched by Honda Canada Inc., making the even annual event another huge success. Don’t worry if you couldn’t attend Fan Friday – you can still donate year round through the organization’s website. You can also make a $5.00 donation by texting the word ‘DREAM’ to 41010 from any mobile phone. Here at Henley Honda, we love to support our community in any way we can. For more info on what we do, check out our Community Page!